The Schwinn AC Sport Indoor Cycle is a level entry bike that sports a number of premium features not normally included in a bike for beginners and a feature that is not usual for spin bikes. In our review we look at these features and more in assessing how good the bike is for those getting started and how it stands up for those with more experience. This is a spin bike that comes with magnetic resistance, the ability to coast, dual SPD/toe basket pedals, fully adjustable and a heavy flywheel. 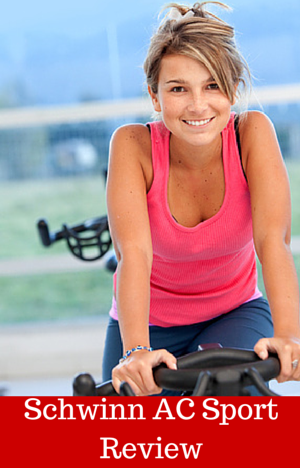 This all gives the basis for great spinning workouts or indoor cycle training sessions in your own home. It seems to be a good quality gym bike. However, it is important that it can deliver quality in the restrictions and requirements in the home for it to be one that is worth buying with your hard earned cash. It does look like it is a bike that can grow with you as you progress. Also we check out if it’s for someone who has already progressed beyond the beginner stage and is looking for a bike that can stand up to more challenging workouts. First up we look at just how stable and durable the bike is. The bike is made from galvanized steel and the adjustment poles from stainless steel that can support up to 300 lbs of weight. It doesn’t move around or feel like it is going wobble or shake. This is still the case when the adjustment poles are fully extended and when you are moving out of the saddle and pedaling hard. The flywheel weight 40 lbs that gives the feeling that you are riding an outdoor bike, it prevents any jerkiness or feeling that you are in too easy a gear and the bike is getting ahead of you. To keep the bike in shape for many years use there is some cleaning and maintenance required. It’s not much but it does mean you get a better longer term riding experience. It involves inspecting that all the nuts and bolts are tight, adjusting the chain and the smart release function. It doesn’t take too much time and is detailed in the manual. It is no different to what you should do with any piece of cardio equipment. Underneath the stabilizer bars are leveling feet for when you are using the bike on an uneven surface. You can adjust these feet to stop the bike from rocking side to side. The bike is fully adjustable with both the seat and handlebars able to be moved vertically and horizontally to size the bike correctly for different body shapes. The bike can fit a wide range of heights from 4 ft 11 inches to 6 ft 8 inches, so it covers many people. For most households this adjustment range will cover the adults who are going to use the bike. The adjustment holes allow 1/2 inch adjustments in the vertical making it easier to fit for height and leg length. The horizontal adjustment is not so great with there being only 3 adjustment holes in each that you can adjust them to. Schwinn have put some thought into this and have done this for a reason. They call it the Quick Fit System. The seats’ 3 positions are marked neutral and plus and minus. They believe for 85% of people the neutral position is right for them because they have designed angle of the pole to accommodate most people’s shape. The other 2 adjustment holes will accommodate the other 15% of people. This makes it quick to adjust but also stops people from adjusting the seat to wrong position and suffering from overuse injuries. The handlebars also only have 3 positions and this is more for comfort rather than bad posture. The 3 positions are plus, neutral and negative. The people who ride outdoor bikes will want to move the handlebars away from them to get the same riding position they are used to and those who don’t may want to sit a little more upright and can bring the handlebars closer to them. These adjustments are quick to do using the knobs – you loosen them and pull the pin and move the pole to the right position and then insert the pin then lock the knobs tight. This is quick to do so more than one person can ride the bike in a household. It takes only a few minutes before you can be riding the bike. The bike comes with magnetic resistance that is called virtual contact resistance technology by the company. It uses a principle known as eddy currents to create resistance by having a set of 6 magnets that move towards and away from the flywheel to change the amount of resistance you push against. The magnets never touch the flywheel but the closer they get the tougher it is to pedal against. Magnetic resistance when compared to friction resistance has a number of advantages. It doesn’t make any noise, there are no surfaces rubbing against one another so they don’t get worn down, there is no need to replace pads and there is little to no dust given off from it. You adjust the amount of resistance you want to against by turning the knob at the top of the frame. You only need to make small adjustments to feel it increase. It is incremental so you don’t go from hard to impossible in one 1/4 of a turn. When you cycle faster you’ll also notice a higher level of resistance which is a result of how the magnetic current work. It’s not a lot but this happens with all magnetic resistance bikes. The amount of resistance being applied is not marked to let you know where you have moved it to. This can make it difficult to know where you last set it to if someone has moved the setting in the meantime. This lack of marked levels is not unusual for spin bikes but bikes that come with magnetic resistance and a console do have levels marked such as the Keiser M3 Plus (but it is more expensive). The bike comes with a chain type drive as you find on an outdoors bike. It helps to give a feel of being on an outdoors bike. It also means that it makes a similar noise as it moves over the sprockets. It’s not loud and it is unlikely to distract as you ride. You may need to turn up the TV a notch or two but it unlikely to disturb anyone sleeping in the next room or in the next apartment. The other thing that is like an outside bike is that you will need to maintain the chain as it will need lubricating and tightening to keep it all in running properly. It doesn’t take too much time to do this and doesn’t involve specialist knowledge. You just need to do it as required. The Schwinn AC Sport Indoor Cycle comes with Smart Release functionality. This is where if you hold your feet firm or pedal back slightly the flywheel will freewheel and the pedals stop turning. This is unusual for spin bikes as most in this price range have a fixed gear arrangement where the pedals keep turning while the flywheel keeps turning. This is easier on the joints when you want to stop but does mean you may take it easier during your workouts and not get that last drop or effort out of the workout. When properly adjusted there should be no slipping. If there is the Smart Release is set too loose and needs to tightened up to prevent this. There are videos on Schwinn’s site showing how to do this. If you don’t like being able to coast you can also tighten it up to lock the Smart release so the bike works like it has a fixed gear which is the same as many other spin bikes. The bike comes with dual pedals. One side fits SPD shoes and the other has toe baskets with adjustable straps for tightening on to ordinary athletic shoes. You get a good grip on the pedals and your feet don’t slip at any time during the pedal cycle so you can be jumping in and out of the saddle or pedaling hard. If you have other specialist shoes the pedals won’t fit but you can change them for other bike pedals to accommodate the shoes. The Q factor for the bike is 170 mm or 6.69 inches, this is the horizontal distance between the insides of the pedals. This is a reasonable width and should be comfortable for most riders. As general rule the smaller the distance between the pedals the more natural the feel of the ride and the less likely there will be for any overuse injuries. Seat. The bike has a dual density seat for comfort to help absorb some of the shock by flexing when you are moving up and down on the seat. You may find it more comfortable but not necessarily so, as whether a seat is comfortable is down to personal preference. If you don’t like the seat you can change it for one you do because it fits standard size seats. You can also try padded bike shorts or a gel cover as well to lessen the pain. Noise. It is not a silent bike as you can hear the chain moving over the sprocket as you would with an outdoors bike. It is not that loud and is not likely to annoy others or wake them up while it is in use. The only quieter bikes would be those with a belt drive. Dust and Dirt. The bike will drop lubricant and you may drop sweat on the floor which can damage it. If you are concerned about this a rubber exercise mat is enough to prevent damage to most floor surfaces. Handlebars. The handlebars are more shaped like a road bike for a better overall feel. They have been covered by a rubberized material for better grip especially when your hand get wet from sweat. The shape of handlebars allows you to rest hands in the middle when getting started and sat down, you can then move the hands to shoulder width apart when you want for more leverage and when out of the saddle you can grip the ends of the bars. Not everyone has the room to keep their bike in one spot as they need that room for other things for day to day living. It is a heavy bike. Fortunately there are 2 wheels at the front that make moving the 126 lbs of the bike easier to do. You tip the bike forwards on to the wheels which take most of the weight and can move it around to where you want it. You do need to be careful you don’t overbalance while you move it but it is quite steady while you move it. The wheels can be a little stiff on carpet but are fine on hard surfaces. Be careful on wood floors to ensure that the wheels don’t scratch or dent it. The bike needs only 48 inches by 20 inches when being stored out of the way but will need more room when being used to allow you to safely use it and to get on and off it. The bike comes mostly assembled leaving you to attach a few parts to it to complete it. It should take at most an hour. The assembly is straightforward which is just as well because the instructions aren’t the clearest with many different languages all mixed in together. The most difficult part of the process is likely to be handling the weight of the bike and you may want to have someone hold it steady for you while you put it together, in particular the stabilizer bars. The pieces you need to add in addition to the stabilizers are the pedals, adjustment poles, seat and handlebars. Not all tools are supplied and you need to have a number 2 Phillips screwdriver and a 13 mm wrench to complete the assembly. The bike does not come with a console. Not everyone wants a console but they can be great for tracking progress and motivation. Spin bikes in this price range sometimes do have basic consoles that track things like distance traveled, speed, calories burned, time elapsed , RPM and can monitor heart rate if you have a compatible heart rate strap. Schwinn do have a console that is designed for the bike that can be bought separately. It does cost $249 called the Mpower Echelon Console. It measures RPM, stage time, total time, calories and heart rate if a compatible Ant+ heart rate strap is being worn. The data can be uploaded to a Ant+ sports watch or USB flash drive. To measure Watts you need to buy an Echelon Power Upgrade which can cost another $299 making this an expensive option. Unless you are really keen on the bike you might want to consider another model of bike. The Keiser M3 Plus has magnetic resistance, a belt drive and a console and costs between $400 – $500 more. You do need to record the data manually as it does not have a function for uploading the data. It is highly rated for the quality of the workout you can from it. There are also Cateye consoles for outdoor bikes that you can make fit the bike but will require some DIY skills and innovation to get it to fit. In particular to add the magnet to flywheel because it is designed to fit on a spoke rather than a flywheel and you need to make sure it doesn’t interfere with the resistance magnets. You don’t get too many accessories with the bike which is not unusual for indoor cycles or spin bikes at this price range. You get 2 water bottle holders which are at the front of the bike just below the handlebars. They are in easy in reach and the bottle just sit in the holder making them easy to grab when you need a drink. Having 2 holders does mean you won’t be having to get off when you are doing a long work out. One of the holders might be able to be used as a place to rest your MP3 player if you strap it on, otherwise there is nowhere to place it or plug it in. The reviews online for this bike are very positive. However, there aren’t too many of them. Customer’s like the solid build of the bike and feel they can get a great workout from the bike. They do mention it is similar to bikes that you use at the gym in terms of quality and feel. There is some mention in the reviews of the Smart release functionality making the riding experience a little different to what you may be used to when spinning but this can be adjusted to improve this or to effectively turn it off by following the videos on Schwinn’s site. This bike has a higher price than you normally see for an entry level bike with it priced over $1000. It does come with a number of higher end features with fully adjustable handlebars and seat, magnetic resistance and the ability to coast which explains the premium price. When I checked it qualified for free shipping on Amazon, when I searched online. If this is more than you want to pay as a beginner then check out our listing of the best spin bikes for beginners but they do not have magnetic resistance nor the ability to freewheel but do cost less than $500. There is a lot to like about this spin bike with the magnetic resistance and coasting functionality in particular standing out. It does give the basis for getting intense cardio workouts for beginners and those that are more advanced for many years. The only thing missing is a console for measuring and monitoring performance. The other thing that beginners maybe looking for is pre-set workout programs and this bike doesn’t have them. Most people follow along to YouTube videos or a DVD and this works fine. You may also want to buy a heart rate monitor so you can train in your optimum heart rate zone. Aside from this the concern I have for beginners is the price point. But you are getting a bike that is durable provides a gym quality experience in your own home and one you can progress with. You can just stay focused on getting into great shape. It also will keep up with you as you progress which also makes it great for those with more experience.